Apologies for the long break - after reviewing scheduled drafting topics, I decided to add a couple more in before Jen came back on again. Then I disappeared to sew actual clothes and organize a birthday party and make cardboard stuff. So easy (and enjoyable) to get sidetracked! Anyway, here's where we are with our drafting series: we've finished the full body sloper (front and back) and sleeve block. Up to that point, we'd been talking featureless slopers and blocks, but with Jen's posts on different sleeves and necklines, we moved into "pattern" territory. 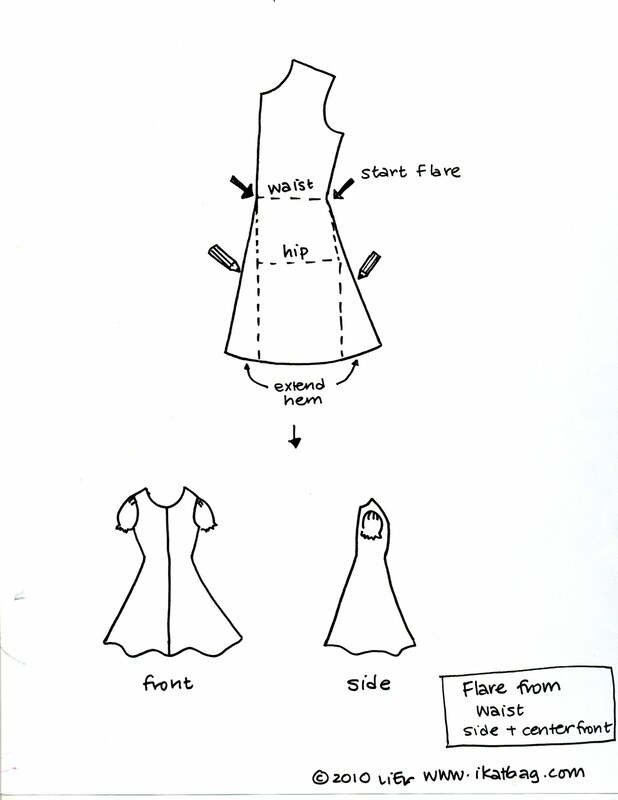 Today we're going to work with the lower half, and create some basic templates for even more patterns. 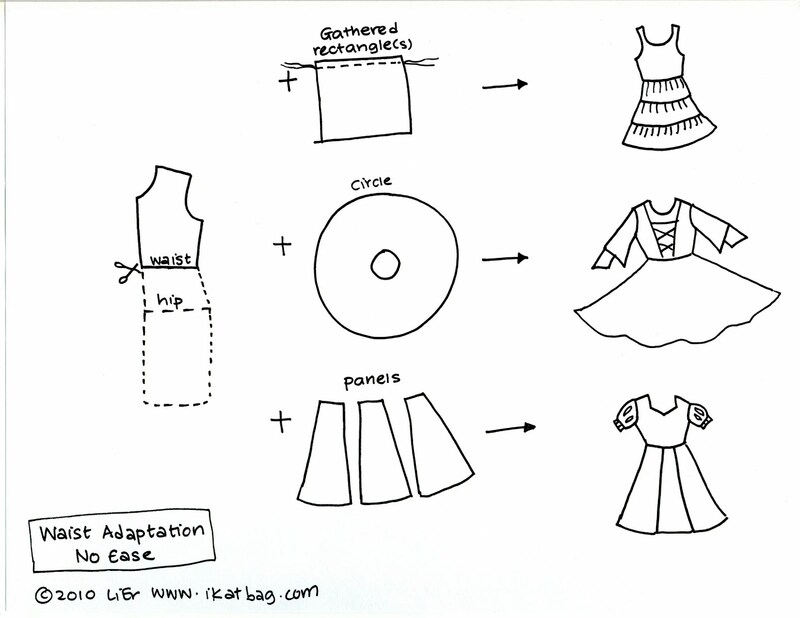 I sketched these cheat sheets two nights ago, and included a garment idea with each adaptation. Many of these garment ideas border on costumey, but I'm going with them for two reasons. One, halloween is drawing nigh so it's a good time to use that sloper! 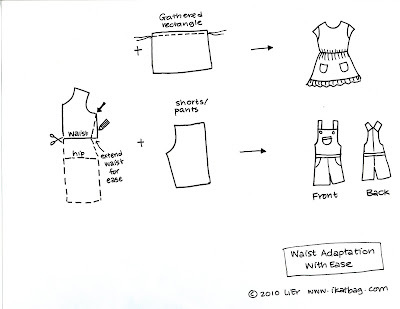 Two, it is usually for costumes that I keep my sloper dimensions as is - otherwise I introduce so much design ease that the garment loses its custom fit and can be worn by half the children in our neighborhood. 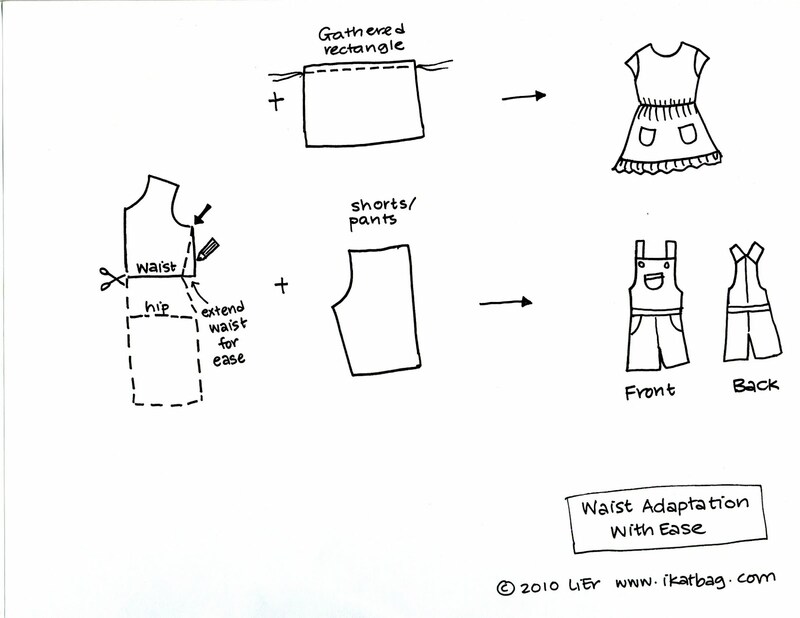 A note: when a garment is fitting (i.e. has little or no ease), putting it on and taking it off will be tricky, if at all possible. 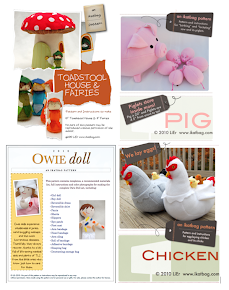 We will need openings and fasteners, like button plackets, hooks or zippers. Sometimes we can get around this by using wide necklines and stretchy knits. Sometimes we need elastic. The point is that while there are ways to facilitate getting in and out of a garment, we have to first decide if said garment requires an opening or not. If it does, this must be drafted into the pattern/design from the beginning. 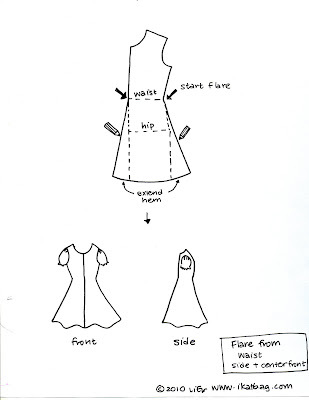 One of the easiest patterns to make is the A-Line dress, or tent. It only has to fit from the chest upwards, below which it flares into a tent-like shape to accommodate almost any body shape. Without adding any ease, it is a regular A-Line dress; with ease in the chest and armscye, it adapts into a jumper or pinafore for layering over an inner shirt. 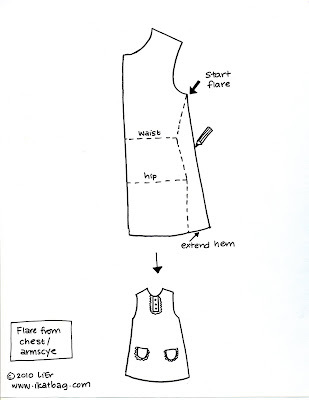 Begin at the bottom of the armscye and flare out the side seam as shown. How slanty to make this side seam is personal preference - as long as it is flared enough to accommodate the hip (or protruding tummy in younger children), it will work. Add ease in the chest and armscye depth (none shown in picture) if you want it to fit more loosely at the armscye, as in the case of jumpers and pinafores. Extend the hem to meet the new side seam. Insert a button placket or zipper through the chest area to facilitate putting on and taking off, especially if you didn't add any ease in the chest area. Again, keep the bodice as is, and slant the side seam outwards from the waist, extending the bottom hem to meet the new side seam. This gives a dress with a gentle and flattering side flare to just the skirt region. Classic nurses' uniforms in the old days followed this style. Here's another variation -you could also flare both the side seam and the center front seam as shown below. When laid out on fabric, this new front pattern must now be cut out as two pieces and no longer cut on the center front fold as previously. It will also have a seam in the center front, and not just a fold. This gives a fuller, 4-gore skirt that flares symmetrically. It is a popular style for many costumes, including princess type dresses. Also known in its shorter variation as The Babydoll. The babydoll is a short dress that has its waist higher than the natural waist. It is fitted in the bodice through the chest region, below which the skirt begins. 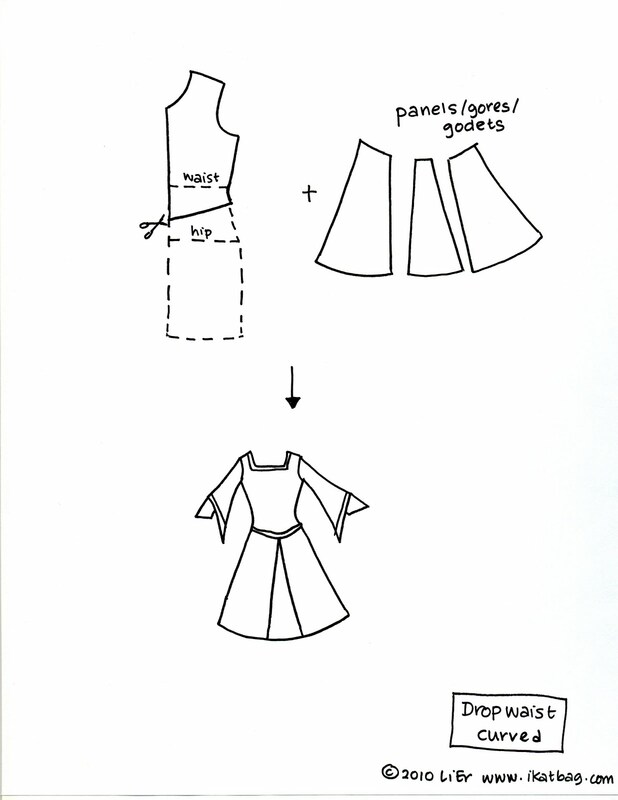 Chop off the sloper at the chest area, and insert a skirt. 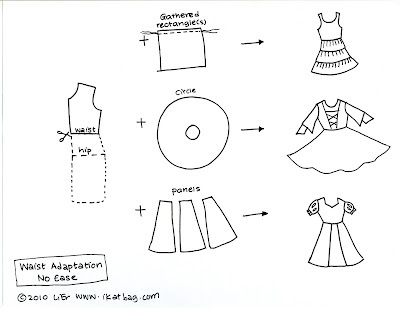 This can be an A-Line skirt (trapezoid in shape - like Kate's Strawberry Shortcake suit), a gathered skirt (rectangle in shape, and gathered to fit the chest circumference) or circular or part-circular (donut or segment thereof). The first has no ease at the waist. 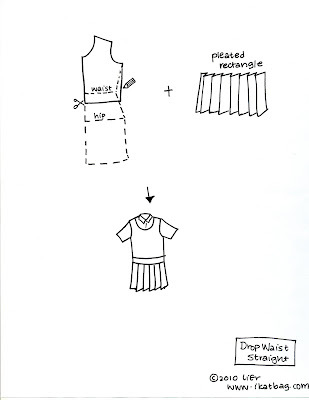 The circumference of the skirt's waistline is the same as the circumference of the bodice's waistline, so they connect exactly. As these designs are fitted to the waist, you'll need a zipper or button placket that extends through the waist and as possibly as low as the hip. For more instructions in the construction and dimensions of the skirts themselves, you might like to mosey over to my ancient summer skirts tutorials. The second variation has ease in the waist. Again, chop the sloper off at the waist, but (duh) add some ease to the waist. 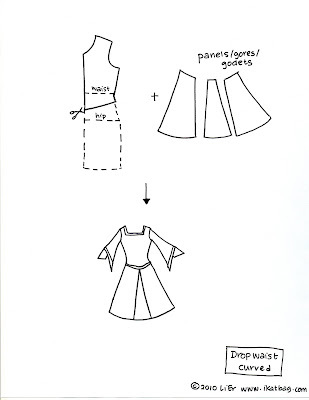 A gathered skirt can be added to the bodice just as before, but the entire waist area - including the bodice - will be gathered. A popular version of this is in knit, with elastic sewn into the gathered waistline itself (serge directly over the elastic while stretching it!) so that it pops on and off over the head without needing a zipper. 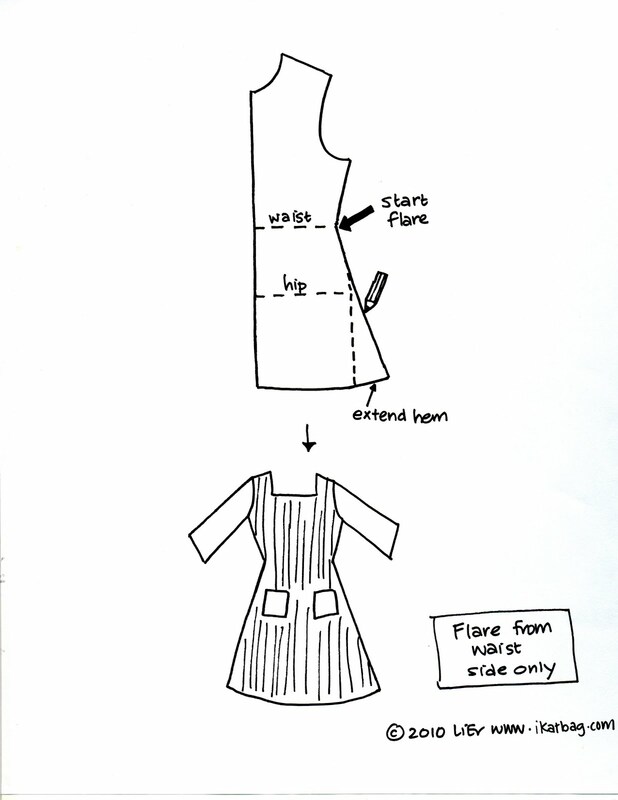 This can also form the basis for overalls or bib-shorts, if a trouser pattern is added instead of a skirt. The opposite of the empire line in that the skirt begins below the natural waist. In this first variation, there is no ease added. The sloper is chopped off below the natural waist and a skirt joined to the new waistline. This new waistline can be horizontal, assymetrical or V-shaped/curved. I used this adaptation for the Renaissance Festival costumes for the girls here. The second variation has ease added to the waist, and then chopped off below the natural waist. A simple skirt is then sewn to this new lower waistline. 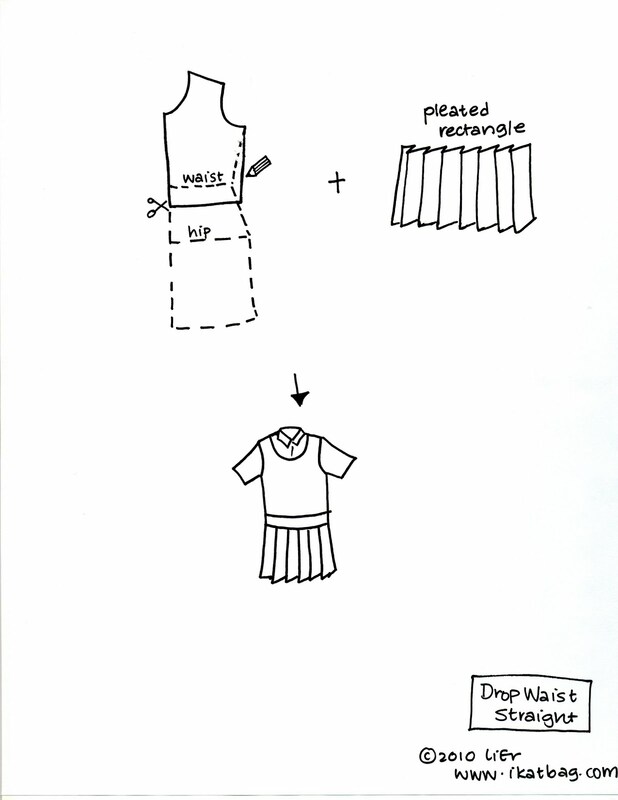 I like pleated skirts a lot, and this makes a cute school-uniform-style pinafore. Some of these designs are deconstructed in those summer skirts tutorials mentioned earlier. Some good news: you can use the skirt block for yourself (i.e. yes, women!!!) too, so it's not only the kids that have all the fun. I'll mention this again in the next post where we take pity on the boys, men and women and invite them to our drafting party! I just can´t thank you enough for this series of drafting! I now have a sloper for me (invented the missing part myself) and my daughter. My son has so far escaped my attemps with the measuring tape. I now feel much more confident in sewing, drafting and adjusting. Thanks Lorraine, Appreciate your efforts! You don't know how grateful I am for this. I have a lot of fancy pattern drafting books, but your explanations make more sense to me. Thank you so much. Thank you for this wonderful site and all the tutorials. I had a chance to visit an orphanage of 2004 Tsunami orphans in Batam, and felt a desire to teach the girls sewing. Your site help me organize my lessons, really appreciate this site. Thank you so much. 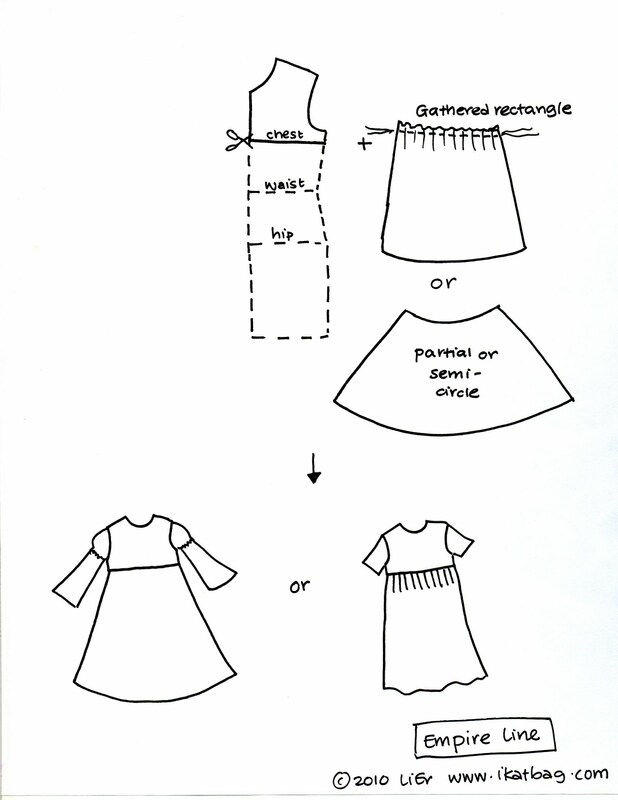 When creating a pattern for a garment based on your child's sloper, how much ease did you add for growth, and where in particular did you find it was needed? I have a 2 year old and want her clothes to last a little while before she outgrows them, but I don't have much experience in where most growth occurs, ie length vs width vs arm/neck circumfrences? Thanks for your advice and this amazing series! Steff: The bad news first - up till 4 years old, your kid is going to grow fast, and outgrow clothes on an almost half-yearly basis. Something that fit when she was two will no longer fit when she's 2.5 years old. Whenever I sew for my small kids, I don't bother to make them elaborate outfits because they won't get more than 6 months use of them. Especially with our bizarre seasonal weather. Kate's (my now 5 year old) halloween costumes were only valid for one year- by the following year, she could no longer wear them. To avoid this, people often sew clothes that hang like sacks on their small children, just so they can get a lot more mileage on the outfits. I feel very bad for the kids because they look like they're swimming in their dresses. The point of learning to sew for one's kids is to be able to make in-the-moment outfits that fit well, knowing that, one year down the road, when those outfits no longer fit, one can whip up more. I've heard about people, using commercial patterns, choosing the 3T size pattern for their 2-year-old (even though the 2T size currently fit their child) just so their kid could grow into the dress. And meanwhile, the kid wears a dress that clearly looks the wrong size. Sad. (i) She gave me the graded-up pattern size for the same dress. She drafted her own patterns, so she essentially traced out the pattern she actually used for one-year-old Emily, and then superimposed over that, the 18-month version, and the 24-month version. This way, she said, if I so felt like it, I could sew the same dress in bigger versions. (ii) She sewed in "allowances for growth" into Emily's 1-year-old-size dress. These included large (like 1") seam allowances in the side seams and a 2" hem allowance. 1 As long as your kid is below the age of 4, expect that she will grow fast, and many of your outfits will be outgrown within the year (sooner, if you have 4 seasons). 2 And therefore, you might have to choose whether to have a nicely-fitting outfit now, which would probably last half a year, a year at the most OR a loose thing which will not look as well-made BUT which will last her longer. 3 If you choose the former, pick simple styles which don't require a lot of effort with detailing and embroidery and whatnot so you won't feel bad when it gets outgrown in less than a year. OR ensure you have a younger daughter to inherit the dresses. 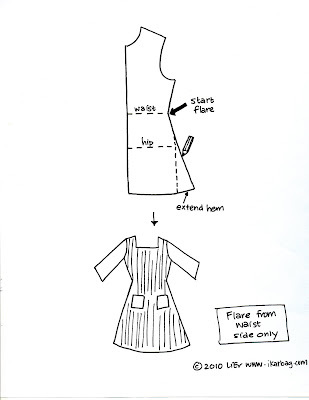 -cutting the skirt extra long and folding up the hem of the skirt (or the sleeve hems) so that you have fabric to let out as your kid shoots up. 5 If you choose the latter (i.e. 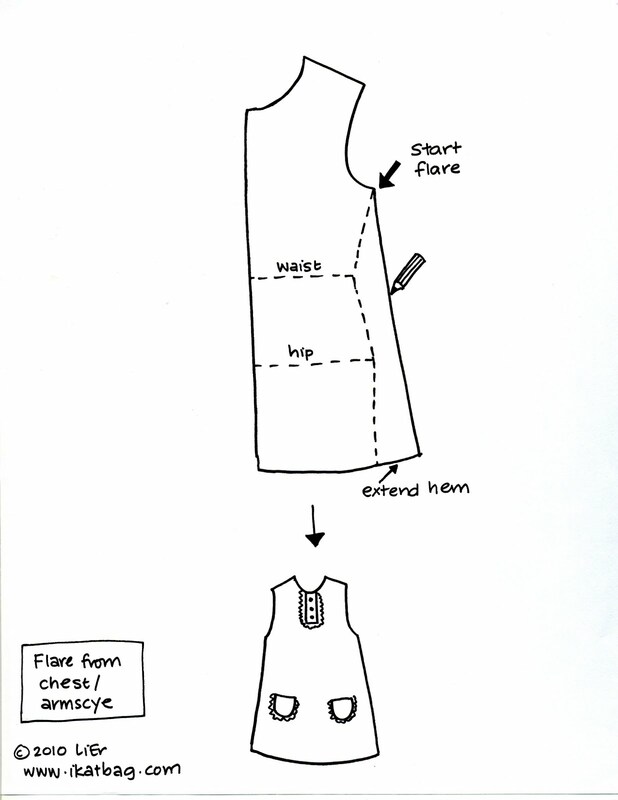 deliberately sew a loose outfit for growth), then allow for most of the growth in the vertical direction. 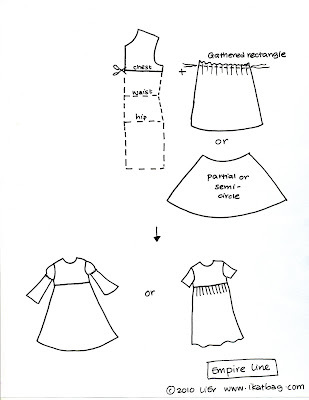 So make the dress or skirt extra long (this is why many babies' dresses are almost calf-length). Arms will also get longer fast, so make longer sleeves. 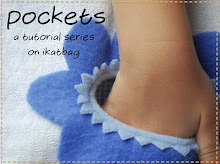 As the child elongates, their shoulder-to-waist distance grows, too, so waisted dresses will start to look as if they're babydolls and empirelines, as your kid gets taller. The child's shoulders will not change much in slope or width, compared to their heights. Neither will their neck size. They'll also start to lose their belly plumpness as they get older so it's not likely that they'll need to let out their waists much. Their chests might grow some, too, but just an inch and a half of ease all around will accommodate for it. All that said, it depends on the individual child, too. My 4-and 6- year old can share clothes because their shoulders are almost the same but my 8-year-old has shot up and her shoulders have widened to the point where she looks like a teenage professional swimmer. It's body type, I think. That helps so much! Thank you!! Hi. †ђξ front And back sloper pages are not opening. Pls can U̶̲̥̅̊ help ♍ƺ out? Drafting Part X - What About The Boys?